Right away, we learn that the narrator (a scribe) is experiencing a case of spiritual restlessness. He’s on a quest to learn more about his tribal history and theorizes the various possibilities of his tribe’s inception in Eden.This story has a philosophical tone and is told through the narrator’s subjective prism– which makes his character easy to connect with on a personal level. His uncertainty and hunt for answers is the driving force of this narrative, which is what kept me engaged and immersed in this adventurous journey. “Apes of Eden” is elegantly crafted, whimsical, and witty. I enjoyed reading it and I know you will too. A fresh take on ancient ideas, told through the lens of the future. Thought-provoking symbolism, witty commentary on the human condition, and a sense of humor that will leave you chuckling throughout… The Apes of Eden is a book you won’t want to put down! 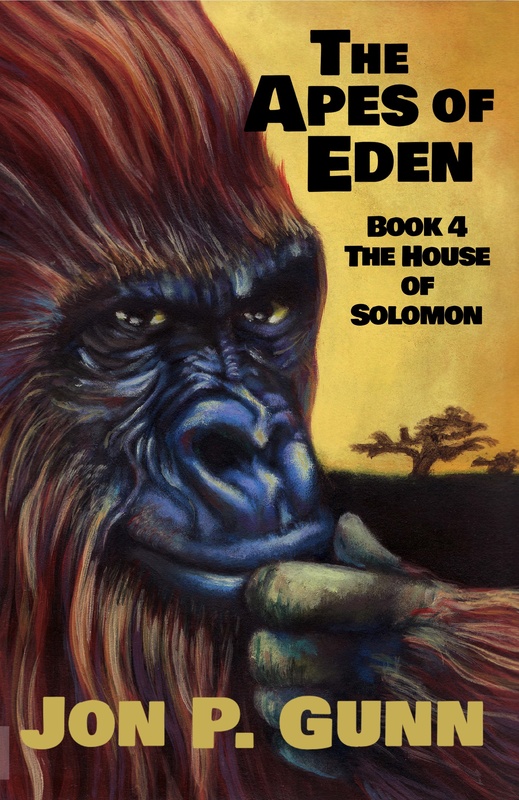 The Apes of Eden was my go to Friday/Saturday night read. I truly enjoyed reading this unique tale while enjoying a Merlot (or two). Creative, humorous, and entertaining! “The Apes” is a scroll turner. Kudos to Jon Gunn. A beautifully written story about our beginnings as human beings with lots of humor that will make you smile!!! Intellectually written and one that will become a favorite you will want to read over and over again! !